So I was trying to get a freeware optical character recognition program for some reason a few months ago. Sometimes trying to get something for free is going to cost you. I can’t even remember what I had scanned and was trying to get into document form. The first one I downloaded was filled with adware that was so intrusive that I removed it immediately, as it turned out, not soon enough avoid messing my computer up. I found one that worked for my purpose, and used it. I use Avast (a paid for copy) for most malware and viruses. I occasionally run Malware Bytes to get rid of anything Avast is having trouble with. The program that I installed that caused the damage was busy everywhere it seems. The first thing it did was replace all my search engines with Yahoo. I had a heck of a time getting rid of it too. Avast was able to tell me the problem, but it couldn’t automatically fix it. In order to get rid of the search engine replacement, I had to re-install both Chrome, and Facebook. I messed around for about a day trying to get rid of it without doing this, and it just seemed to keep coming back. Running Avast got rid of all traces of the malware, but you know how malware will keep cropping up on a PC. I don’t like backing up my iPhone on “The Cloud”. I guess I don’t trust a computer that is not under my control. (kind of like certain government officials!) I can remember the old days of networks where the IT guys would make you run a program that was installed on a remote server. Often, things would go wrong, so I became fond of having everything installed locally. I’m sure things are better now. Heck, you can’t even install “Office” locally any more, can you? I’ve always backed up my phone locally on my home computer, but when I plugged my phone into my computer, it did not give me the usual questions about connecting and downloading my pictures. It did not automatically start iTunes and offer to back up my phone. My computer barely recognized that there was an iPhone connected to it, and I couldn’t really access it from explorer. I ran iTunes manually, and it could not see my phone, nor could it connect to the App Store. It kept telling me that I wasn’t connected to the Internet. The first thing I did was re-install the iTunes program. This didn’t work at all. The next thing I did was remove the driver for the iPhone and let Windows install a new one. This allowed Windows to attach to my iPhone and it let me download and save the pictures off of it, but it did not let me attach my iPhone to iTunes and there was still the issue with the App Store. I decided that maybe the latest copy of iTunes was defective, so I rolled back a few revisions and loaded that. It wouldn’t run because of an issue with a data file that was left over from the latest install of iTunes. I tried removing the data file, so of course it wouldn’t run at all then. I went to the trusty Internet, and asked about trouble connecting to App Store. The first article told me that I may have a Proxy server installed. I didn’t, but I’ve seen malware do this to your connection. I think it makes it easier to steal your data. Some of the articles led me to believe that it was my Host’s file, or that my firewall was blocking it. Wrong, and wrong. I had iTunes on the list of programs that could access the Internet through the firewall. Finally, one of the articles I read pointed to a potential problem with Bonjour, a program that iTunes uses to connect to the Internet, not being able to get a “WinSocket”. Then the article pointed me to a program called Autoruns, http://download.cnet.com/Autoruns/3000-2094_4-10744886.html That tells you exactly what your PC is running in the background will it’s just sitting there. One of the tabs in Autoruns is called Winsock Providers. I saw that Bonjour had a socket, but there were four entries for a VOT module and under the “Image Path” was “File Not Found”. This entry was in my registry. I looked up the VOT module on the Internet, (Autoruns had the missing file as votprx64.dll) and found out that it was part of a malware package. I knew then what had happened. My antimalware program had removed the file, but my registry was now corrupt and pointing at a nonexistent file. This was somehow getting in the way of Bonjour in its attempt to establish a WinSocket to communicate to the Internet through. All I had to do then, was go to my registry editor, (regedit) and remove the offending line from my registry. I went ahead and backed up my registry first, then looked for all instances of the votprx64.dll, and removed them. I rebooted my computer, and everything just started working again…. YAY!! I just got this virus warning from a friend. I’ve gotten other warnings from him that were somewhat inaccurate. This one comes with a “snopes” link (as some others have) http://www.snopes.com/computer/virus/hereyouhave.asp It reads just like the “Life is beautiful” virus hoax. One difference is that there is a real virus associated with this warning. There was an infected web page associated with this email, but I read that it has been taken down. There are still infected attachments associated with this file that look like either a “WMV” movie file, or a “PDF” file. DO NOT OPEN THESE ATTACHMENTS! The infected email propagates itself by going into your email address book and sending itself out to all of your contacts. This should still act as a warning for you not to open up any unknown attachments. Good antimalware software will warn you about the attachment before you open it, and you should also be able to scan the attachment manually before you open it. Since I sell PC type computers, don’t expect a completely unbiased report. People ask me if I think they should by an Apple computer, or a PC type computer. The advantages of a Mac can’t be ignored. There is a much lower chance of a Mac getting a virus, or spyware on it. The reasons are twofold. Number one; there are not many people out there in cyberland who are writing malware for Macintosh’s (that would be an excellent name for a band). The user base is just too small. Number two; the Mac has somewhat better security built into the operating system than a PC. Most Mac heads well tell you that my number two is actually the main reason. Personally, I don’t believe this. If Macintosh’s were more popular, there WOULD be more malware out there written for them. Another reason to go for a Mac is that the hardware that is available for the Mac is good and reliable. If it was built for a Mac, then it will run on a Mac. You’re not going to have any trouble digging up drivers to make the hardware run on your computer. For the downside, you’re going to pay twice as much for a Mac as you will for an equally powerful PC. Hardware devices designed for a Mac are usually FROM Apple and are expensive. Macs are built nicely, well laid out and kind of pretty, but you WILL pay extra for all of that. Another bad thing is that there are fewer people writing software of ANY kind for a Mac, so you might not be able to get the programs you need to do what you want on a Mac. This is especially true if you are in the engineering field. If you are doing artwork, desktop publishing, or journalism, then you can probably get what you need for a Mac. 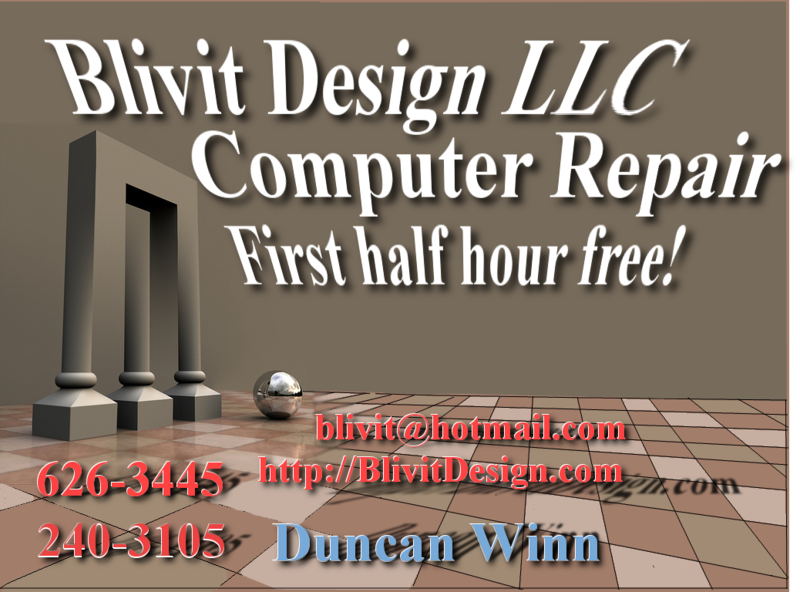 If you are really worried about malware, get Blivit Design to build you a PC, and get UBUNTU Linux on it. Linux doesn’t get malware and it is less expensive to get Linux on a PC then it is to get Windows 7. The drawbacks of Linux are that there is little commercial software available to run under Linux. The advantage is that there is a whole LOT of software that will run under Linux that you can get for FREE! Like I always say FREE IS GOOD!!! Ubuntu Linux is pretty solid. The interface looks similar to Windows 7 (or at least XP) and as far as email and surfing the web, you will never know you’re not on a Windows machine. It also comes with Open Office installed, and that is nearly as good as MS Office. Yesterday I broke down and bought 10 USB Thumb drives. In my computer class, I always tell my students that they need to get themselves a USB Thumb drive in order to save and transport their data from one computer to another. Most of my students do not have a computer of their own, and in order to save things like Resume’s and cover letters to use in their job hunting activities, they need to have a method of saving them. I’ve always thought that I was doing my students somewhat of a disservice by telling them they need to get a thumb drive, showing them what one looks like, but then not showing them how to use one. Now that I’ve bought a bunch of them to use in class, I can actually show them how they are used. The only drawback to using the thumb drives in class, is that we still must get through the material in the two hours allotted to the class, and now I have more material to cover. Fortunately, we only had 4 students in class this Wednesday, so we were able to get them all through the material, complete with a working email address in the allotted time. Once again, I would like to thank my most steadfast helper, Daunine Vining. Without her help, it would be impossible to get the job done. Dauning is a Commercial Interior Designer who is in the middle of taking an advanced AutoCAD class. I’m just happy that she takes time off to help me teach the computer literacy class. As I told you before, I won some FREE advertising with “CoolerTalk” of Reno. I did some artwork for the sign. Here it is. I get some free artwork from the CoolerTalk people, so I will contrast and compare. Maybe they can come up with something even better. This might have some astigmatism on this representation. I taught only 6 people yesterday. Everybody kept up pretty well except one person in the back. She just wasn’t into it. I’m not sure what she expected out of the class, but she already had an email address and didn’t accept my “just treat it as an exercise” reason for being there. I did get 5 people signed up. Now the other teacher in the Sparks class is using my method of having them put their user name and password on a MS Word document before they attempt the email sign up on Google Mail. This works so much better when it comes time to put their passwords in twice the same way when they can’t see the characters (you know, just ******** for a password). Most people (usually me too) have problems typing in the “mystery word” at the end of the signup process that’s there to discourage “bots” from getting Gmail accounts. This time, in addition to showing them how the computer can “see” the thumb drive on “My Computer” when you plug it in, I showed them how to save their “Word” document to their thumb drive. I’ve been talking about them getting a thumb drive for every class, and this is the first time I’ve had a chance to show them how it is used. I got 5 out of 6 students signed up (everybody who Wanted to sign up), and had them send me an email. I replied to each one, and showed them the reply before they left. I finished in the two hour allotted time. I think I’m getting better at this “teaching” thing…. I had Daunine and Patrick helping me. They did a good job of helping without running over my lecture. I went to the Northern Nevada Chamber of Commerce Business Forum on Tuesday. (www.sparkschamber.org | Connect with us on Facebook | Email Us) It was a good networking event. I got to meet with a lot of the local businesses and the breakout sessions were informative. It had a “continental” breakfast. That wasn’t so hot. The only truly continental breakfast I’ve ever had was over in Germany. Now THAT was quite a spread. I’m told by my brother-in-law that Americans get their idea of a continental breakfast from the French. I’ve never been to France (except for landing in Paris and catching a connecting flight to Germany). I gave out a lot of business cards and hopefully I’ll get some call backs. Perhaps the best thing to come out of it for Blivit Design, is the fact that I won a drawing for some FREE advertising with “CoolerTalk” of Reno. 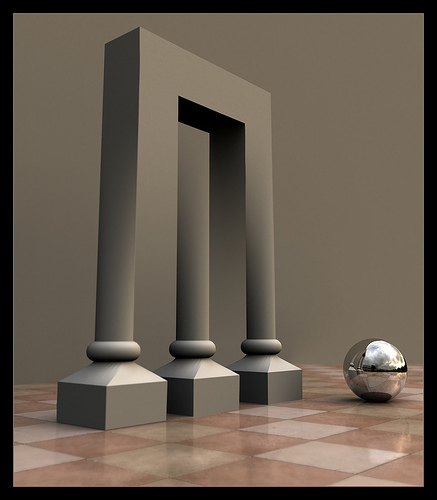 I found a cool new Blivit picture here.